Interesting characters, both human and equine, enrich the lives of veterinarians everyday. I Make Horse Calls, More Horse Calls and Call Dr Tebow, She Makes Horse Calls are collections of true heartwarming, not heartbreaking, stories from equine veterinary practice. It has been 30 years since James Herriot captivated reading audiences world-wide with his heartwarming and poignant stories from rural veterinary practice in England. If you loved All Creatures Great and Small, you'll love these books too. Join a modern American veterinarian as she travels the countryside helping an intriguing array of horse owners and their equally interesting horses. From the rare diseases that pose diagnostic challenges, to the exhilaration of saving lives and the joy of life itself, these true, uplifting stories allow the reader a personal glimpse into the world of veterinary practice. Dr Thibeault's books define the importance of teamwork between owner and veterinarian in order to save the lives of animals, while exposing the depth of the human-animal bond. 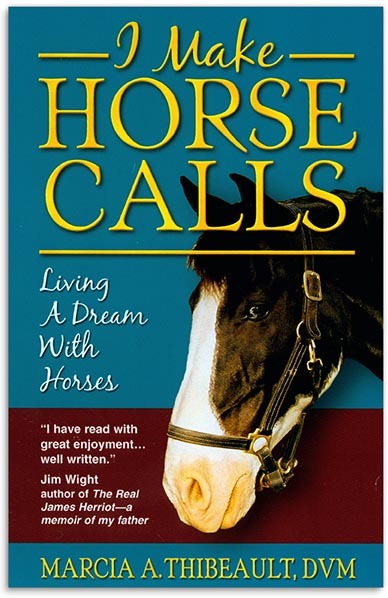 These humorous and poignant stories entertain readers with a wide array of equine and human characters and along the way deliver small doses of education about horse care. They illustrate the dedication of veterinarians and the important role owners play in the health care team that maintains their horses' good health. If you've ever thought about becoming a veterinarian, you'll enjoy following the author on her challenging journey from show horse groom, through pre-vet classes through veterinary school and into practice. Suitable for ages 12 and up, the stories are mostly humorous, reflecting life with a small dose of poignancy.